Big Finish’s latest series of adventures for the Fourth Doctor adopts the same boxed set format as last year, containing eight stories split across two months and two sets. This time, however, there’s a storyline tying them all together under the umbrella title of The Syndicate Masterplan. Given that the opening story is set in 1978 and begins moments after The Invasion of Time finishes, the idea of a series-long arc for the Fourth Doctor never feels like a jarring, modern conceit given that we have The Key to Time just around the corner. With Leela left behind on Gallifrey and K-9 Mk II still in need of assembly, the Doctor needs a new companion. The Sinestran Kill provides one in the form of WPC Ann Kelso and, refreshingly, it appears that the Fourth Doctor actually wants her around. It’s not until you listen to Jane Slavin and Tom Baker that you realise the Fourth Doctor always seemed to have companions thrust upon him, a reflection of Baker’s own situation behind the scenes. Think about it; Leela forces her way on board the TARDIS, Romana is dropped off by the White Guardian, Adric stows away, Tegan accidentally wanders inside and Nyssa literally has nowhere else to go. The last person the Doctor actually invited to join him was K-9. It’s therefore something of a novelty to have scenes where the Fourth Doctor is impressed by someone and keen to show them the universe. Writer Andrew Smith wisely opens the story from Ann’s perspective, as she pops in to visit her friend Tony whilst walking her beat as a WPC. Soon enough, Tony has attracted the attention of local gangsters sent to kill him, local gangsters with impossibly futuristic technology. Naturally, it is this impossibly futuristic technology which will bring the Doctor bumbling into WPC Ann Kelso’s life. The early scenes between both characters are brilliantly written by Smith. In particular, the line “That all depends on how you react when I say yes” invokes a feeling of warmth and joy that you only get from the top tier Doctor and companion pairings. Much of this is down to the clear affection that Baker and Slavin have for each other, which is reflected in the easy chemistry between both characters. Baker gets some terrific Doctor moments here, too, suggesting that the introduction of a new companion allows the opportunity to showcase his Doctor at his very best. One particular exchange between the Doctor and thuggish gangster Hugo Blick about alien disguises and naturally fat faces is hilarious and calls to mind some of Baker’s very best moments in the role. The rest of the cast are rather upstaged by our two leads, Glynis Barber and Ewan Bailey occasionally feel like two dimensional gangster archetypes in their roles as the villainous Blick couple. Frank Skinner’s DCI Nelson is never entirely convincing as the head of Scotland Yard’s gang task force but ably captures the weary indignation of dealing with the Doctor and two separate alien races. 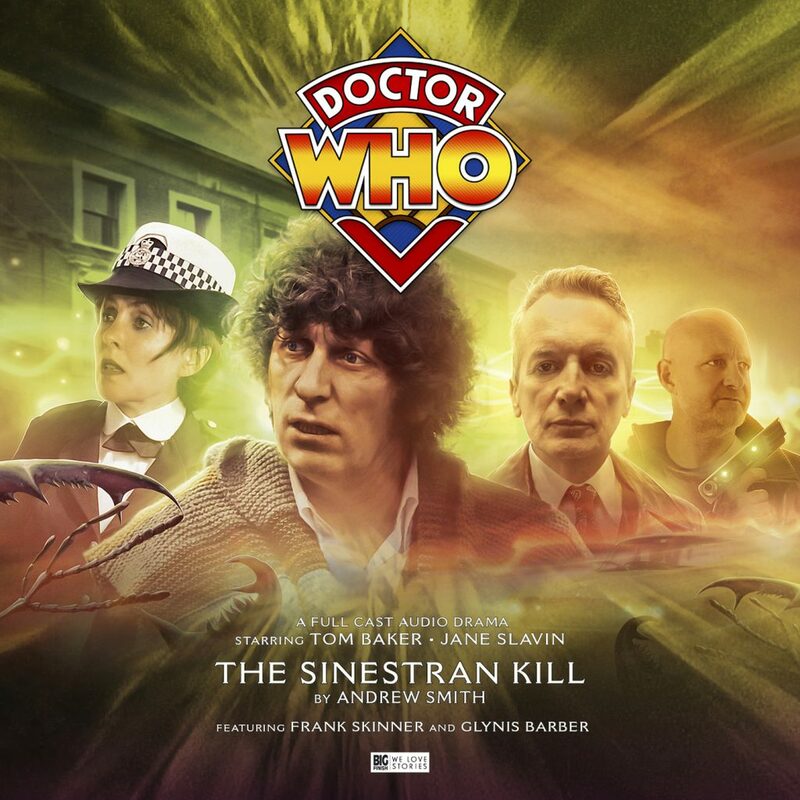 The Sinestran Kill is clearly attempting to reflect the affectionate genre pastiches that 1970s Doctor Who did so well, obvious cop show touchstones being The Gentle Touch, The Sweeney, Juliet Bravo etc. On paper it absolutely works, the boggle eyed bohemian Fourth Doctor materialising in the gruff world of plain clothes detectives and Cockney gangsters, raising merry hell as he does so. It’s just unfortunate that the direction and some of the performances impede the story from achieving the full potential of its premise. All that being said, once the plot takes a left field turn into something more akin to John Carpenter’s Assault on Precinct 13, Nicholas Khan really comes into his own as Blick’s henchman Jimmy, a snarling, sinister villain. It is in these climactic moments that the threads of Smith’s script and, presumably, the larger arc come into focus intriguing both Ann Kelso and us as listeners. Overall, this is an entertaining debut for a new companion who shows a great deal of promise, if anyone can help the Doctor solve the mystery of the enigmatic syndicate then it’s the level headed, sharp and funny WPC Ann Kelso. The Doctor may have a date with the White Guardian and Romana I in his future, but I’m certainly hoping we can postpone that for as long as possible. Cast: Tom Baker (The Doctor), Jane Slavin (Ann Kelso), Frank Skinner (DCI Scott Neilson), Glynis Barber(Kathy Blake), Ewan Bailey (Hugo Blake), Nicholas Khan (Jimmy Lynch), Leon Williams (Tony Reynolds). Other parts played by members of the cast.